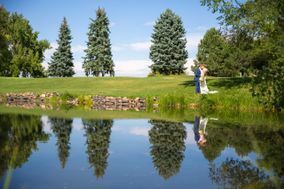 The Vista at Applewood Golf Course far exceeded our expectations of any wedding venue we toured, and we feel as though we got more than our money’s worth. Keely went above and beyond to ensure that not only was everything organized but she helped to bring our wedding vision to life. She was quick to respond to all inquiries and was very helpful in talking through all options with us. Jeff, the food and beverage manager, spent the entire evening sprinting around the reception hall ensuring that everything went off without a hitch, while also constantly checking on my husband and I to see what we needed. The food was outstanding and Chef gave us one of the most delicious meals of our life (the appetizers are to die for and the steak was perfect). The entire staff was professional, friendly, and provided outstanding service not only to us and our wedding party but our guests as well. 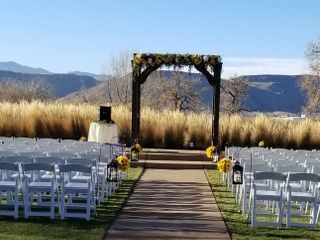 Furthermore, the venue and the view itself is absolutely amazing - it has the real "Colorado feel" we were looking for and provides spectacular views from afternoon into the evening hours. I cannot tell you how many comments our guests made about the beauty and service The Vista at Applewood provided us. I would wholeheartedly and without reservation recommend this venue for your wedding or any large event! I literally cannnot day enough good things about Keely and the staff at The Vista at Applewood. From our first visit with Keely to our wedding day was about 7 weeks. Keely was absolutely amazing to work with. I had no idea what I needed to do or when it needed to be done. Keely has tons of experience and was always happy to provide suggestions for vendors and make sure everything was on track. She kept in touch and even helped locate specialty items like an amazing rose gold tablecloth for our cake table. I honestly don’t think I could have pulled off such an amazing wedding without her! The venue is absolutely beautiful! 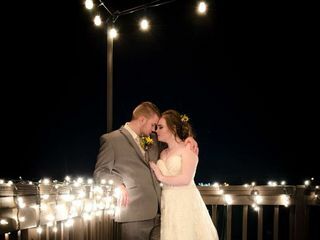 Unfortunately we got the one snowy day in like 6 weeks and could not use the outside ceremony space but we took some photos near it (in the snow) which I think will be gorgeous. The inside is well maintained and many of our guests commented on how nice it was. The food was amazing and nobody went hungry with the buffet options provided. But better than the venue was the staff who helped us set up, keep things going and finish up the night. Tatum and Heather went above and beyond to make sure everything was perfect. Every staff member was friendly and wonderful to the guests. I would absolutely recommend this venue! My wedding day would not have been as amazing without the staff at The Vista at Applewood. We were so happy with our experience at the Vista. Keeley and Tatum and the whole staff were amazing to work with. Our guests commented on their friendliness and attentiveness. The food was great. Everything was perfect! The team at Applewood was beyond amazing! They were there for us every step of the way! When we found out the catering manager was leaving two months before our wedding, I’ll admit I was a bit nervous. Jeff, the head bartender, sat in on our tasting to make sure the transition was seem less! Keely then stepped in and we knew we were in excellent hands! Every single person at Applewood made our guests feel at home and, because of them, our day was absolutely perfect!!!! Applewood is a great two-in-one! They provide the catering and the chef is out of this world! He accommodated our nut free and gluten free friends. The food at the cocktail hour was phenomenal and our friends and family cannot stop talking about how absolutely delicious their dinner was! The staff at the Vista Applewood was amazing! Everything went really well and all were so helpful in this process. The only hiccup was the one hour of cash bar was supposed to be through the dinner hour but was not. "Fish" was very accommodating and made everything work. The food was phenomenal! we got lots of comments on how good the food was so thank you to the chef!! Thanks so much to Keely, Tatum, Fish and all other staff that assisted on 6/9/18!! Will for sure recommend to others getting married!! The Vista at Applewood could not have been more helpful when planning our wedding. Tara was very helpful, responsive and honest with the cost and helped us keep our wedding within our budget! 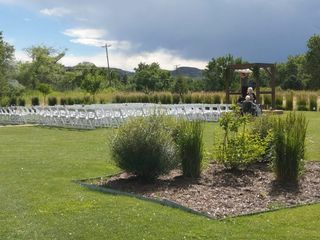 The ceremony garden is beautiful and the reception area is spacious with great views and ambiance. What was most outstanding though was the service and attention to detail provided by Tara Lyndsy at The Vista. She answered all of our questions and handled all of the details for us. The wedding was amazing and everything we had hoped for. Thank you Jeanne, it was such a pleasure working with you! Tara at the Bista did a great job helping my family and in laws plan for my big day. The food overall was very good. Most of my guests complemented how good the food turned out. 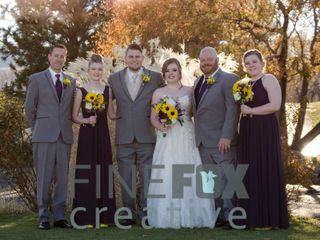 My photographers also took some great photos of us and my bridal party on the golf course. I would recommend this venue to be a good place for a reception for the Golden, CO area. Thank you so much Jessica! It was great working with you! My wedding is July 31,2016. I had definitely shopped around when it came to finding the perfect Venue. The moment I saw The Vista at Applewood in person I fell in love immediately. As much as I loved it I knew it was time to talk pricing (I mean golf courses aren't cheap). As I was presented a package for the pricing I was put at ease. Applewood is a beautiful place at a great price. They provide so much in their packages and make the food on site. Tara has been incredible to work with so far and always responds to emails in a timely fashion. I love this Venue and cannot wait to marry my best friend at such a spectacular venue! Dear Jezaray, Thank you so much for the wonderful review. It has been a pleasure working with you so far and can't wait until your big day next July!! Thank you Loyda and Nick. You were such a lovely couple to work with and your wedding was so beautiful! I'm so excited to hear you will be planning more events with us in the near future! Tara and the Staff at The Vista! Alexandra you were so sweet and a pleasure to work with! So glad we could be a part of your special day! From the moment we walked in we fall in love with the place and right after we knew that working with Tara and Geoff was going to be easy and not overwealming. Tara gave us pointers with some details for the wedding and was very accomodating everytime we showed up just to see the venue AGAIN! Geoff went far and beyond to accomodate our drinks favorites for our enjoyment. The day of the weddign was perfect and full of joy for both of us. We had a wonderful experience at the Vista. Tara and Geoff were incredibly helpful and accommodating. Tara took the time to find out exactly what we wanted, including the main course, beverages, a band, h'ordeuvres, and a sundae bar. The food was incredible, and the staff was professional and timely. We are thankful for such a great experience! Thank you so much for the wonderful review. You are so sweet and it was a pleasure working with you! 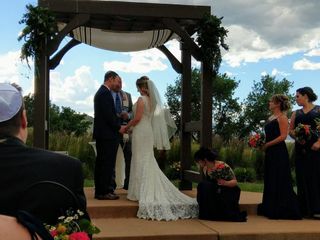 We are so glad we chose The Vista at Applewood Golf course for our special day. Planning a wedding in Colorado from Arizona went by smoothly with Tara's help from the day we were interested in the venue to the day of the wedding. All of the staff were amazing including Geoff and the new wedding coordinator, they helped me through the day to keep the stress off! Family and friends still tell us how laid back and fun the staff were. Such a beautiful well kept place, my wedding pictures are beautiful. Thank you Amy! I'm so glad you were happy with The Vista and our Team! It was a pleasure working with you! Our 4th Of July wedding at Applewood Golf Course was beautiful. You were able to see all the fireworks from the dining area's large open windows and on the deck. Tara was very helpful, but not overwhelming during the planning process. I wanted to plan everything myself and Tara was great about giving suggestions on everything I was unsure of. On the day of the wedding Tara was right by my side and completely guided us through the process. Time goes by very fast, and it is wonderful to have someone guide you through all the steps of a wedding. This service was a blessing and something I had not even thought about. The venue was beautiful. They had the grass, flowers, and grounds in great shape. The ceremony site was perfect. Now, THE FOOD! The food was AMAZING! The catering manager, Geoff, was great to work with. 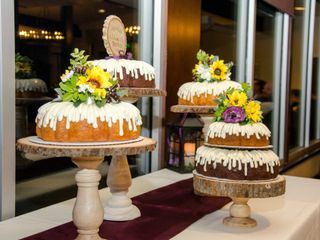 I had many people tell us that was the best food they have ever eaten at a wedding. We had Beef Tenderloin and Chicken Piccata as our main dishes. Sides of green beans with roasted tomatoes, whipped garlic mashed potatoes, ceasar salad, and dinner rolls. Completely outstanding. The cocktail hour h'ordeuvres blew everyone away! On a scale of 1-10 I would give them a 10! It is at least worth a call to Tara to get an exact price quote. Amie, You were so laid back and easy to work with you made our jobs easy! Your wedding was so fun and your guests were so nice. Come visit us anytime! This was such a wonderful venue for a wedding! Not only is it a beautiful place, but the staff at The Vista at Applewood were terrific to deal with and they made the day extra special. Tara & Brian were especially accommodating and worked with us to stay within our budget. Thanks Michelle! It was so fun working with you and your family!! The Vista staff made our big day a HUGE hit with all our guests! We, as the couple getting married, had no worries about decorations, time line, or food/drink! We were able to fully enjoy our big day! Thank you The Vista and all the staff!!! We are so happy that we picked this site for our wedding! My husband and I looked at several locations, and they all felt very "salesy" and cookie cutter. Beautiful, but not right. When we arrived at the Vista, Tara was more than happy to show us around (bless her heart, she was 8 months pregnant at the time!). The ceremony garden was beautiful, big open space and very green. Beautiful walk to the site. And the reception hall was also gorgeous: very modern looking. It has pretty distinct colors to it, but any wedding colors will work. The pricing was very reasonable, and no site fee which was a bonus! Tara was an excellent planner up to the day and was willing to answer all of my silly questions. She even ordered a tree for us to plant for the ceremony! Geoff was the day of coordinator who was on top of everything. We dealt with A LOT of rain on wedding day, but that makes the memories more perfect. If you are as indecisive as we were about your wedding details, the people at the Vista will give you the best input and best options to make your day spectacular. Thanks Alison! It was so great working with you and Jeffrey, It's always fun working with such great couples such as yourselves. Congratulations!! We had to find a new venue with just over 100 days to go. The Vista at Applewood Golf Course had our date open and we could not be happier! Everything leading up to our big day was great. I had to contact Tara many times with questions and she always got back to me in a timely manner. On our wedding day, everything was set up as we expected and looked beautiful! We were running behind a little but everything worked out. Geoff and the wait staff went out of their way to make us and our guests comfortable. The food was even better than at our tasting and every guest I talked to at the wedding and afterwards said how great the food was. I cannot imagine any other venue pulling off such a great event. 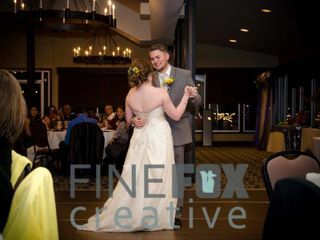 We are so glad that we selected The Vista at Applewood Golf Course for our wedding reception! Tara and Geoff were so great to work with and they made everything run incredibly smoothly from the decorations to the food service and the timeline. They provided such a high level of service and accommodated all of our needs. We were planning a wedding on a budget and I feel that we were able to have a beautiful and elegant wedding on a tight budget thanks to them! They were so flexible with our schedule and let us stay longer than the stated time and let us use the grounds for photos, going as far as stopping golf ears in the course of play for us to get great photos on the beautiful course with views of the mountains. So this venue pretty much has it all - great views, a beautiful ballroom, delicious food, amazing service from dedicated staff, all at a tremendous price!! Thanks Lacey we were so happy to be a part of your special day! Everything went spectacular last night. The staff working were awesome and really seemed like they enjoyed having our students there for prom. Everything went very smoothly and I couldn't have asked for a better experience with help organizing this particular event. Thank you for being easy to communicate with and making the evening stress-free! We had our wedding June of 2016. We had picked the Vista over a year ago and am so happy we did. We knew that we wanted to Vista from the very first visit. We loved the idea of having a wedding outside on a golf course and having a spacious reception with a great patio. The Vista had all of this! An added bonus was the great price for the venue, food and drinks! Tara and Miranda were very helpful throughout the process of the wedding. I knew exactly what I wanted the decor and details to look like and I was able to do everything that I wanted. They were extremely flexible and were a great sound board for the ideas I wanted. It was nice to have them to email or call whenever I needed something. The day went flawlessly. We did not have a coordinator but everything was set up so beautifully and nothing went wrong. The ceremony garden was stunning with an amazing view, the patio was perfect for cocktail hour and the tables and decor inside were put together perfectly! We had SO many compliments on how great the food was and the open bar added to the fun! We wouldn't have changed a single thing from our wedding day and we are on cloud 9 when we look at back at the pictures of the best day ever! Thank you Vista and everyone who contributed to making our day so special! Everything was wonderful!! The planning process, the staff, the venue, the food- it was all wonderful. We got so many complements on the whole event- people are still talking about the food. The Vista handled last minute changes great and were very flexible with our wedding. They did everything to help keep the bride calm and stress free so she could enjoy the day.